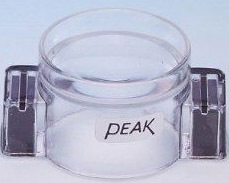 These scales, especially the 50mm one are very useful for measuring or calibrating in the dissecting scope magnification range when a long scale is required. Japanese made. ANSI and CE compliant; all-around protection, gas tight and with ventilation vents. Comfortable soft edges for a good fit. All purpose magnifier with 2 lenses, economical, but optically superior. 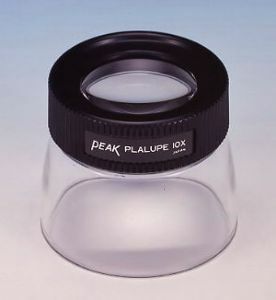 A series of simple magnifiers by the top Japanese manufacturer Peak. These are very handy for EM, photography, microelectronics, and other purposes. The acrylic tube allows light to illuminate the subject and acts as a focus pre-set. No focal adjustment is required; simply set the fixed focus magnifier on the object. However, the acrylic tube may be partially unscrewed and this gives a focus adjustment if your sight requires that. 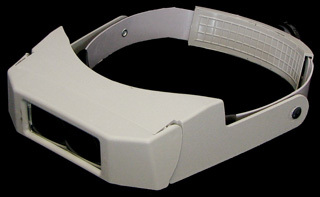 The higher magnification units are optically more complex. Both 15x and 22x model are of 3-element construction and cover a relatively wide field of view. 10x is a Kellner type magnifier, 2-elements, bright and good contrast are further attributes. 22x has an effective aperture of 12mm, net weight is 22g. O4322 comes in a durable storage pouch. Microscope type magnifier, but upright image produced with 4 elements in 2 groups. Designed to show the complete field with the eye's pupil only 8mm from the upper lens. 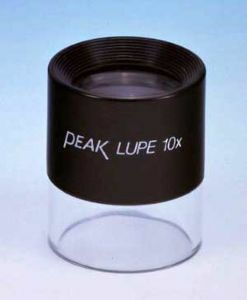 Such high power magnifiers have a shallow range of focus and need to be used with care. 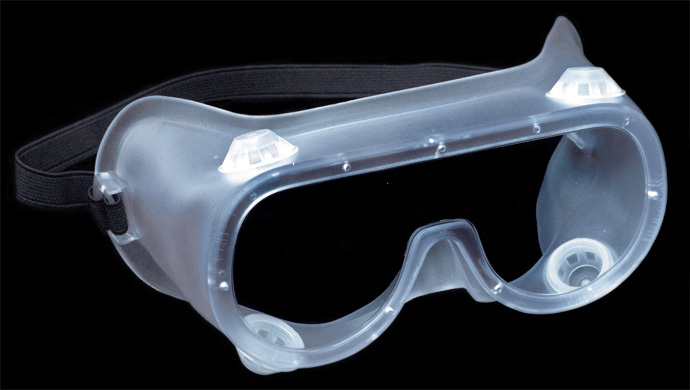 Both magnifiers come in a durable storage pouch. O4630L requires 2 AA Batteries (not included). 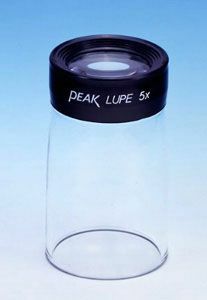 The swing magnifier has the same specifications as the standard Peak Lupe Magnifiers. 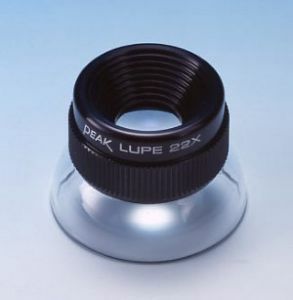 A focus ring compensates for specimen height and diopter variations. 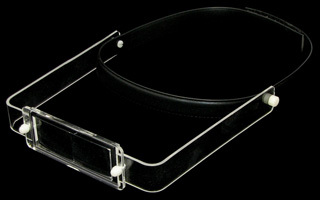 The swing feature makes this magnifier suitable for hands-free use; particularly suited for the graphic arts. The 15x version has an effective aperture of 19mm; weight is 97g. 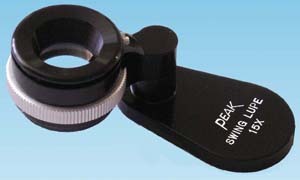 The 22x magnifier has an effective aperture of 10mm; weight is 96g. Both have the dimensions 55 x 32 x 32mm and come in a leather case. 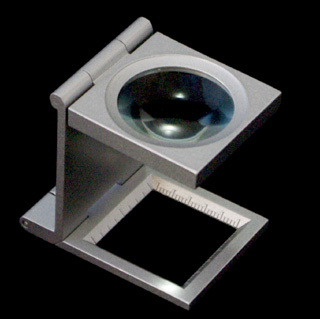 This magnifier features 2 small magnets which allow it to be attached to slide calipers, height gauges, micrometers and other measuring instruments made of steel. 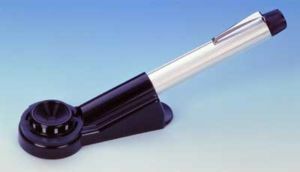 The magnifier can be used in any position and moves easily on the scale. 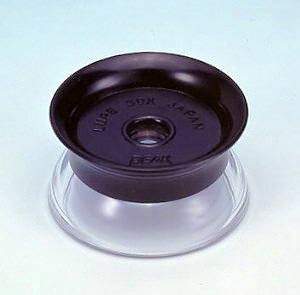 It is useful on steel desks and panels as a combination paper holder and magnifier.